If you’re like me, you try hard to buy the right gift for the women in your life but usually manage to fail. I feel your frustration. I’d like to promise these are guaranteed winners. And I know the skiing women in my life would say they are. Even some of the non-skiers would love these too. But maybe you promised her some jewelry or maybe she hates pink. I wish I could, but I just can’t predict the infinite ways these gift ideas might fail. Good luck. Here is one thing I can say with some certainty: women like to match and/or coordinate with everything they wear, even base layers. If you can splurge I recommend buying a top and bottom set and this midweight pair is a versatile choice. 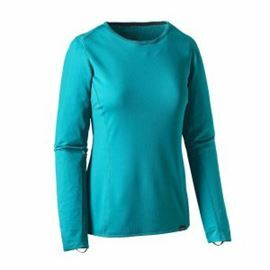 They layer well under a fleece or even another base, wick sweat and dry fast. Treated with Polygiene, they won’t retain odour, key to long term use. Pink, padded for comfort and better grip and length adjustable: just what every woman looks for in a pair of ski poles. A great choice for the backcountry lover, these poles are optimized for ski touring. The length adjusts for awkward sidehilling or changing lengths going up and down. Foam extends below the grip for easy choking up. The basket is designed with heel lifting in mind. And the Trigger grip, Leki’s auto locking strap system, is flexible enough for switching hand positions so you can get more push out of the pole when skinning. 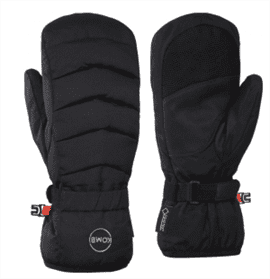 Like a well tailored down jacket these shapely mitts manage to look both feminine and warm. They aren’t huge balls, so getting them into a pole straps isn’t an all thumbs chore. And the synthetic leather palm is touch compatible, so no freezing fingers just to answer a call. With a Gore Tex membrane they’re waterproof and the synthetic insulation is toasty warm.